Due to rising labor cost in China, many companies are forced to relocate their production. Vietnam's wages are significantly lower than those in China and in other Asian countries. However, it is important to understand where and with whom these benefits can be realized. The Vietnamese are also considered to be the Prussians of Asia – They were strained with a relentless desire for a better future. However, without clear leadership, meaningful incentives and deliberate recruitment, the results remain below expectations. One must adapt to take advantage of this young and driven work force continuously. 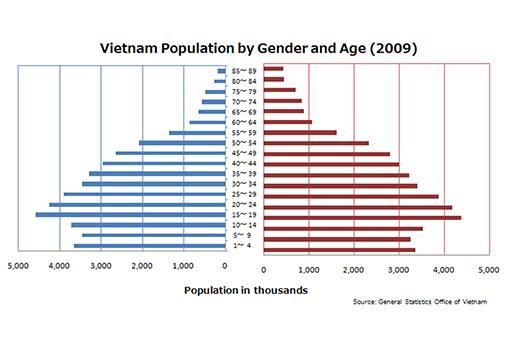 Vietnam has the 3rd largest population among the ASEAN countries, 70% of which are under 35 years old. This means a rich source of labor in the future. Even though the minimum wage has risen every year to protect the people from rapid inflation, Vietnam is still able to compete on costs when compared with the surrounding Asian countries. Moreover, as the Vietnamese dong continues to fall in value, this rise in minimum wage can be seen as having a rather minimal effect from a foreign investment perspective. Labor fisheries processing. Labour electronics assembly. Labor textile industry. High skilled labor.